At its quadrennial convention, the nation’s top labor federation pledged to combat mass incarceration. Los Angeles—The largest federation of US unions, the AFL-CIO, passed resolutions Monday slamming “the big business behind mass incarceration,” promising intensified collaboration with alternative labor groups and granting its leadership new oversight tools designed to spur more effective organizing by its fifty-seven unions. Monday morning brought a floor vote on a resolution backing closer cooperation between the AFL-CIO and “worker centers” that organize and mobilize workers who lack collective bargaining rights, and a greater role for Working America, the AFL-CIO’s own affiliate for non-union workers. As I’ve reported, the vote represented the latest ratification of the federation’s increasing work with such “alt-labor” groups, whose growing ranks include both workers (like taxi drivers) who lack the legal right to unionize, and others (like restaurant workers) who so far haven’t wrested union recognition from their bosses. The vote on the resolution, though limited in its immediate impact, had also become a proxy for disagreements within the federation about whether tightening ties to a broader progressive movement—including civil rights, feminist and environmentalist groups as well as alt-labor—would help or hinder embattled unions. One delegate made an apparently off-the-cuff suggestion from the floor that the resolution should go further, to also oppose pre-employment criminal background checks. That proposal was defeated in a floor vote, after which the original resolution passed. Wayne State University Business Professor Marick Masters told The Nation Monday that based on his review of data from the AFL-CIO’s federal filings, the labor federation spent 23.54 percent of its total disbursements (not counting PAC funds) on politics in 2012, up from 15.46 percent in 2008. Masters noted that such filings are self-reported and inherently inexact, and that the categories provided by the government were not conducive to assessing the resources devoted to workplace organizing fights. An AFL-CIO spokesperson said the federation does not release budget information beyond what’s contained in federal filings. Monday afternoon also brought a contentious and impassioned exchange over one of the most provocative questions surrounding the federation’s role in organizing: how and to what extent it should avert or enter conflicts among multiple unions seeking to represent the same workers (that issue was also highlighted in an August 29 letter announcing the International Longshore and Warehouse Union would depart the AFL-CIO). Speaking from the floor, International Association of Machinists Vice President Sito Pantoja objected to a Saturday vote in which the AFL-CIO’s Constitution Committee had voted to refer amendments proposed by the IAM— involving the federation’s alleged failure to defend its unions against “raids” by others—to its Executive Council rather than putting them up for a floor vote at this week’s convention. The Executive Council called for Trumka to appoint a special committee which would bring recommendations on raiding issues by next February. 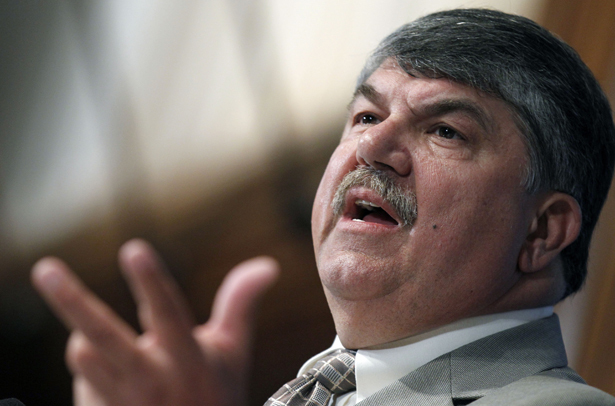 Read Josh Eidelson on day one of the AFL-CIO convention.